The current challenge at Melonheadz Friends is: Use Green Challenge! Spring is on it's way (eventually...) and I loved coloring these critters. I used watercolor pencils and some Patina Stickles on the turtle. 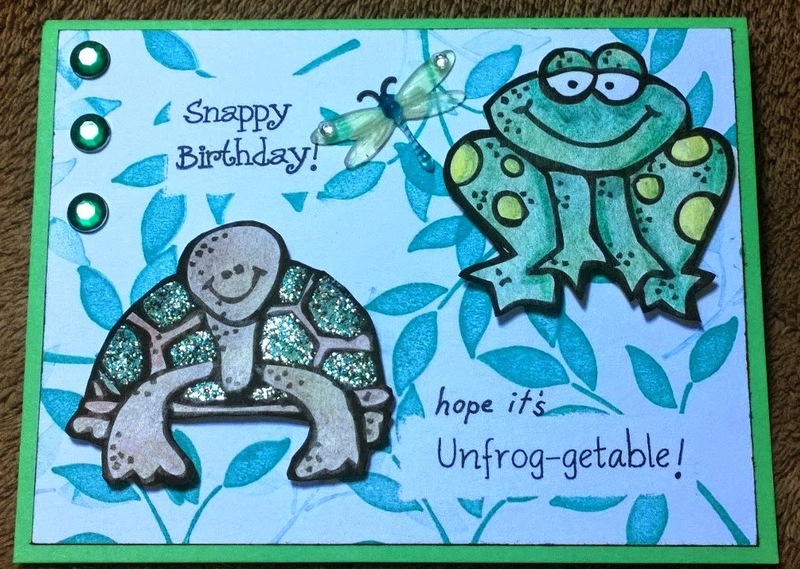 The background is a leaf wood-block stamp from an old Stampin' Up set I purchased online on Ebay. I check Ebay often for stamp sets because you can find real treasures up for auction there! The cute embellishments were a gift. The sentiments are from a My Pink Stamper "Punnylicious" set, plus I have many more cute sayings you will see on future cards! Hope this provided some inspiration. Keep the creativity flowing! More spring butterflies and cute mice! The Cat's Meow and a Butterfly!